Can’t Hurt Me: Master Your Mind and Defy the Odds chronicles David Goggins’ incredible life from perpetual victim to active duty Navy SEAL to world class ultra athlete and world record holder. Now available at these fine retailers. David brings his inspirational story to every engagement with his passionate and empowering presence. He electrifies audiences both large and small, from corporate engagements where he speaks to hundreds of executives or thousands of salespeople to intimate settings with a select group of VIP clients. David electrifies audiences both large and small with his inspirational story, from corporate engagements to private VIP events. David Goggins is considered by many to be among the world’s best ultra-endurance athletes. He has competed in more than 60 endurance races, has placed 3rd at the Badwater 135 Death Valley- considered the world’s toughest foot race, and regularly placing in the top five in other ultramarathons. He also held the Guinness World Record for the most pull-ups done in 24 hours completing 4,030 in 17 hours. From ultra marathons to Guinness world records, David Goggins is considered by many to be among the world’s best ultra- endurance athletes. In my pursuit to understand and learn from the greatest competitors in the world, David Goggins is one that sets the standard. 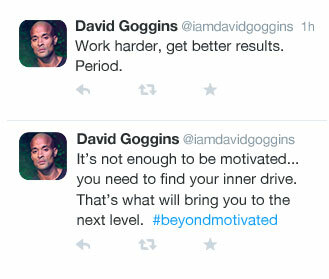 Follow David Goggins for weekly inspirational posts and updates on events and appearances.